For the Second Week of 2010 Challenge the task was to make a card based on my sketch below. 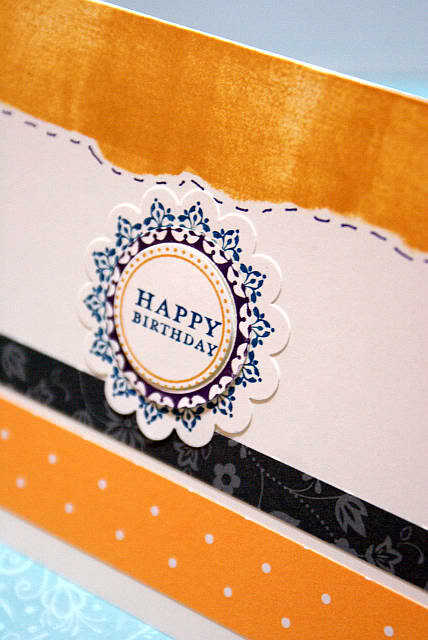 You could use whatever colours, papers, stamps and/or embellishments you liked. You could make it for any occasion you wished. All you had to do was to show me a card based on the sketch. And if you did make a card, you could have won a special little RAK from me. Scroll down to find out what the RAK was and who won. To inspire you I had already made a card with the sketch and had used some of the new stamps from the then upcoming Sale-A-Bration catalogue. For the main embellishment, I stamped out the main image in two different colours, then punched out the different elements of it and put them back together using the two different colours. You can do this too if you have circle punches or Big Shot dies to fit such a circle embellishment. Then I popped up the centre pieces with some Stampin' Dimensionals. You may wonder how I made the top section of the card? I used my brayer and an ink pad for that. I tore a piece of scrap paper to make a mask, then laid that down on the card. I brayered over the torn bit of my mask and the top of the card. 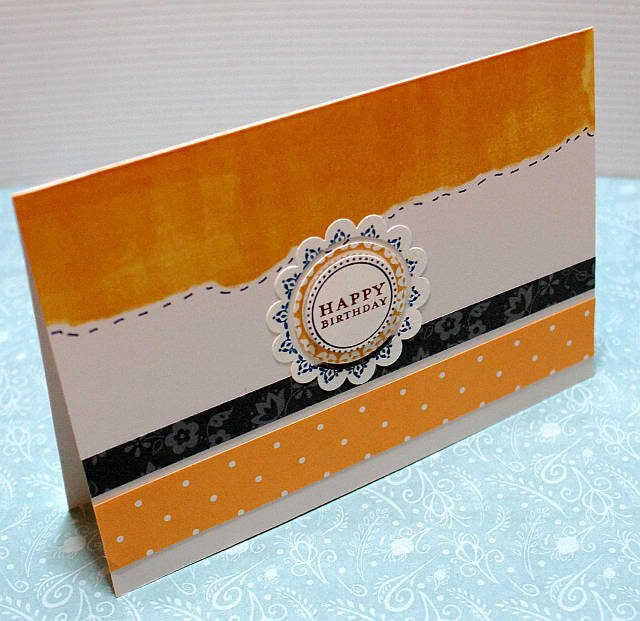 If you would like to see how this type of masking is done, I demonstrate the technique on my Reflections Card page. Don't be afraid to experiment with the sketch a little. Your card doesn't have to wind up being an exact copy of my sketch. 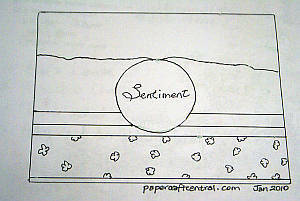 My intent is simply to inspire you to make a card this week that is BASED on the sketch. Now it's your turn. Go ahead and make a card. And be sure to show me what you have made, OK? I'd love to see what you do with the Challenge sketch, anytime. Oh I had better not forget about the little RAK I gave out in 2010. This week the last person to upload an entry (before midnight on Sunday 31st January Eastern Standard Time) received a handmade greeting card from me as a prize. Don't forget there are quite a few other challenges you can try out on the Creative Challenges page!